From Erin Poirier (coordinator): Love4Gambia sports fans, the team is thrilled to back at training for our 4th annual Love4Gambia run from Koina to Banjul. This year’s run will take place in June, 2014 and the team is excited to introduce our Canadian runner to you. From Pa Modou Sarr (Gambia teammate): We’re so please to have you all meet Terry SanCartier. Its a great feeling knowing he will be our runner next year. Terry, we will make sure your run across the Gambia will be one you will forever remember- not only for the run but for the people you will meet along the way. From Kebba Suso (Gambia teammate): Welcome Terry to the family. The team can’t wait to meeting you. Banjul calling!!! From Spider “Dodou” Bah (Gambia teammate): You are highly welcome to the family Terry. The team can’t wait to welcome you and to run together. We will be waiting for our brother Terry. Welcome welcome with joy. Terry SanCartier started running seven years ago practically by accident. At that time, he had no dreams of running a marathon. In school, he was more interested in participating in music, theatre and writing for the school paper. But, it was a friend who encouraged him to run with her at lunchtime. A few months later, he enrolled in a running program to run his first half marathon. He had not completed the half marathon training, that he was already setting his sights on the full marathon distance (42.2 km). In May 2007, he ran his very first marathon in Ottawa. Four months later, he ran his second marathon in Toronto. He was hooked. 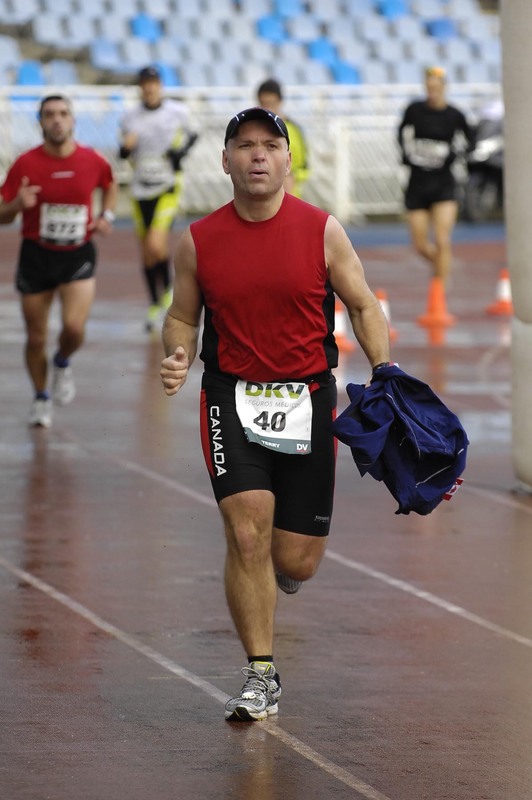 Terry combines his passion for running with his love of travelling and has run in Canada, the USA and Europe. He has completed twenty six marathons so far with the goal of running fifty by the time he is fifty (He will be forty three in November 2013). Originally from northern Ontario, Terry has called Ottawa-Gatineau his home since 1989. His partner in life, Geneviève has two sons. Terry loves them both as if they were his own. He realises the importance of teaching them well and that is why he stands behind NSGA’s education of youth as the path to a brighter future for Gambian families. He works at Shared Services Canada in IT. This entry was posted in Running in Africa, Uncategorized and tagged 2014, Love4Gambia, Terry SanCartier. Bookmark the permalink. Thank you Andrea and Marc!